House-hunters Gordon and Jane were looking forward to buying their first property together after meeting 8 years ago whilst working in the probation service. Nearing retirement, they were hoping to find a property with more space in the county of East Sussex, a place they had both visited for many years. However, they were struggling to see eye-to-eye over exactly where. Wildlife lover Jane longed for the quiet life amongst the rolling hills of the open countryside whereas Gordon dreamt of living amongst a vibrant seaside community. 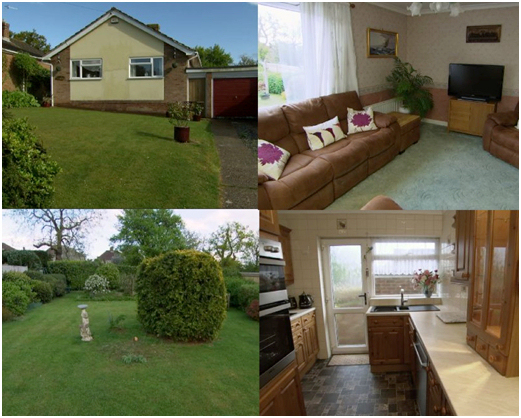 With a budget of £300,000 their requirements included a minimum of 2 bedrooms, a garden and it must be light and airy. After viewing a range of coastal and countryside properties, Gordon and Jane had two coastal properties in the running: a 2-bedroom detached bungalow in North Hastings and an open-plan house in Bexhill. To aid their decision they wanted to take some time to go back to both properties and explore the local areas a little more. During their second trip to East Sussex, Gordon and Jane were impressed with the local pubs, restaurants and coastal walks that North Hastings had to offer. Already loving the large spacious garden on offer with the bungalow, Gordon and Jane’s minds were made up. Going slightly over budget, the couple offered £310,000 for the property and it was accepted.